Front-gabled brick sanctuary with an entrance tower located on the east side at the juncture with the 2-story flat-roofed educational annex. The entire complex was constructed as an ensemble, of Flemish bond and connnon bond brick veneer, with concrete block on the interior. Windows have 4 horizontal panes. The 3-stage entrance tower has a flat roof with a thin spire on top. The cornerstone is inscribed: Holloway Street Christian Church Disciples of Christ 1921 1956." The complex is now the Progressive Holiness Church. 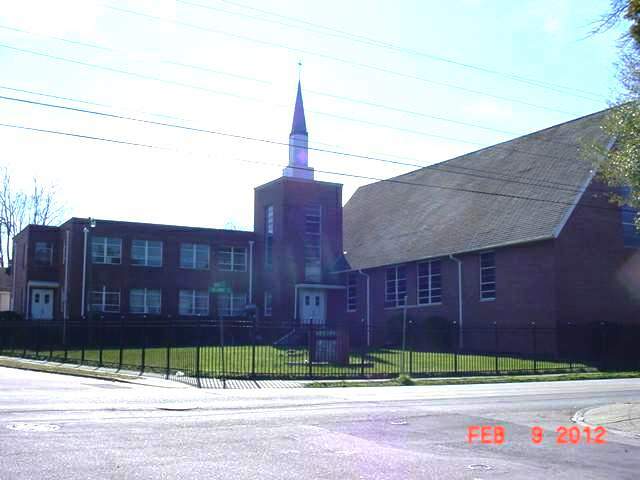 This church was built as a replacement for the original Holloway Street Christian Church, which stood directly across Spruce Street, now demolished.